from the blue chair: Giveaway Winner! I owe you a winner from my giveaway last week. I noticed there was definitely a theme among all those goals mentioned in the comments--sew more, finish more, and buy less. I've really been driven lately to try using what I have--especially the fabric I think I "need" to horde. I wish you all the best of luck in your crafting and sewing projects this coming year. "I don't make resolutions as such, but I'm going to make a concerted effort to finish some quilts, especially some of the tops I've made that I really like." 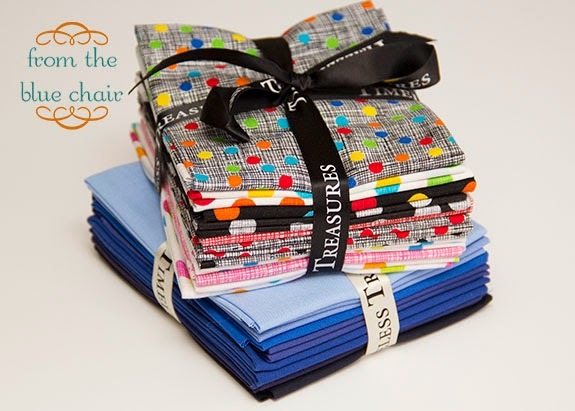 I'll send you an email Carol and get this fabric out to you! Congratulations Carol! You lucky girl!!! Congrats Carol! Have fun with that great bundle!